Wow, been awhile since I’ve made a post. Sorry about that! I’ve been a little busy as of late with some work deliverables and with an upcoming Half Marathon looming a lot of my time is spent pounding the road. Ummm maybe I should correct that, the road has been pounding me as of late. If you recall, I had a sore foot leading up to the Peoria Heights Half (link here). That eventually cleared itself up (after the race) but again on another training run last week I messed up some bones on the top of my foot – can’t win! Trying to run through it and made it past 9 miles tonight, so at worst case pretty sure I can tough it out if it doesn’t clear up by the next race – eventually all the other body parts start hurting worse and you forget about those injuries you had going into the race. In celebration of getting through tonight’s run, figured I’d treat myself to a bird post – not just any bird post though, a NEW CHECK on the list bird post. Anybody recognize this Raptor? If you are like me when I was taking the shots you are probably saying .. Red-Tailed Hawk. That would be an excellent guess since that is the most abundant Hawk in the area. You can’t go 3 miles on our local highways without seeing one of those hanging out on a roadside tree or fencepost scanning the fields for some juicy mice. In the last three years, the Red-Tailed Hawk population has stayed just slightly behind the exploding Turkey Vulture population. However, if you recall, I have already checked that bird off my list on a previous post (link here). About midway through taking these shots it started occurring to me that this particular Hawk was not really displaying the most apparent feature of the initial guess… that would be the RED TAIL part. Now this shoot just got a whole lot more interesting. Actually there a number of differences between the featured bird here and the previous Red-Tail link. It was a little smaller than the Red-Tails but that could have just been a maturity thing. In fact, I had the pleasure of seeing a Red-Tailed Hawk up close today. Upon exiting my truck in the work parking lot I noticed a Hawk flying across toward a nearby evergreen. Needless to say (err make that type), I went in for a closer look. The Hawk was intent at looking out into the lawn and didn’t notice me walk right up under it. Probably the closest I’ve ever been to a wild Hawk and it definitely reminded me how large those Red-Tails are (18-22″ in length, 24-46oz male weight). One large killing machine! It eventually spotted a mouse, swooped down, grabbed it and flew over the building with breakfast. The face seemed darker and maybe a little sleeker than the Red-Tail as well. These particular shots do not show it very well, but it was definitely keeping an eye on me most of the time. Oh, forgot to mention these were taken only a quarter mile down the road from my house. It was spotted on my way home from work so made a quick stop at home, grabbed The Beast and headed back out. At first it let me sit there awhile and photograph from driver side window on the side of the road. Eventually it started getting a little uneasy (who wouldn’t with the big glass pointed at ya’). It made a few more scans into the surrounding fields and then flew further down the road and landed on another pole. No probs, just drive down a little bit and start snapping some more shots. This played out for about 4 poles worth until it decided a small hollow off the road would be a better place to hunt. It wasn’t until I got back in the digital darkroom did I finally figure out what it was. 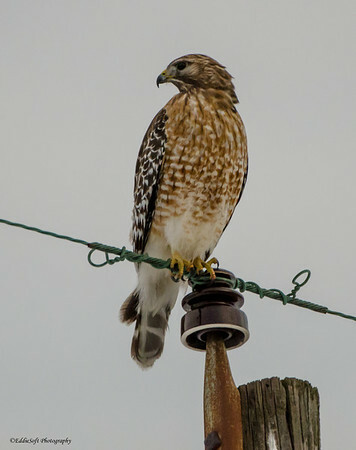 Based on the reference books, determined it was a Red-Shouldered Hawk! I also had Linda confirm that identification on the Illinois Birders Facebook page (’cause everyone knows I don’t do Facebook). Not often do you get to put a new check mark in the bird list so close to home. 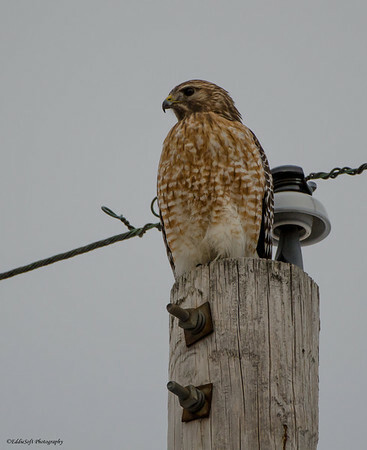 From the region graphs it looks like we are towards the Western boundary of their permanent residence – pretty sure this is the first time I’ve ever seen one since I’ve always verified the red tails on the other Hawks I’ve witnessed in the area. 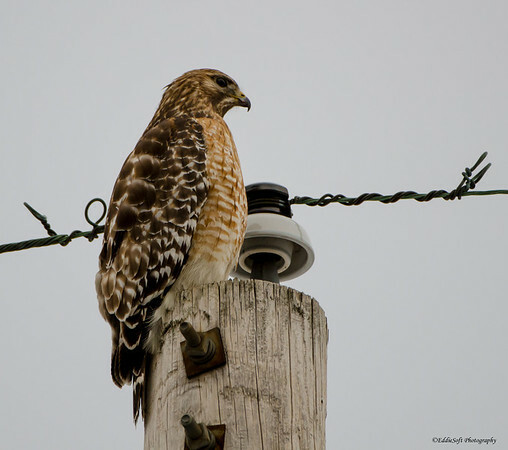 They consider this a medium sized Hawk coming in at the 15 to 23 inch length range (females can be slightly larger than this), 17 to 23 oz and sporting a wingspan in the 37 to 44 inch span – Red-Tails sport a wingspan of 41 to 56. Our friends over Wikipedia mention that they can prey on the standard rodents and chipmunks, but can move up the chain to rabbits and squirrels if they have to – that does not bode well for my 5 pound poodle, bad enough keeping him away from the owls around here. Hey, Linda might like this, they’ll eat snakes. Unfortunately, in the Winter months they will feast on the local inhabitants of backyard feeders (not too pleased about that), but at least they will attack Blue Jays which is perfectly fine with me – hate those damn birds. On a final note I’ll leave you the comfort that these beautiful birds of prey have a conservation status of Least Concern (probably not the greatest of news for the local rodents). There you have it, a new bird for the list! Time to go find some ice for this damn foot. Finally something that gets rid of snakes! I’ve told you a thousand times, there are NO SNAKES anywhere in the township we live in! We looked out and live in the only area void of snakes – quite odd now that I think about it .. be definitely a bonus for you.